One weekend I decided to keep the mid-winter doldrums at bay by making a new duvet cover. I felt very pleased with myself for finally using a fabric I'd had for years, continuing my effort to reduce the size of my fabric stash. The duvet cover turned out nicely and gave the bedroom a cheery fresh look, but I ended up with some long narrow strips of unbleached muslin left over. Still feeling thrifty and motivated, I decided that rather than putting these in my scrap bin, I'd get some scraps out of the bin and see what I could do. The first scraps I came across were from a strawberry print cotton fabric I bought in the early '90s. This is one of my very favorite fabrics. How could one not love tiny strawberries and tiny strawberry blossoms and leaves? Over time, I've made three shirts out of it (two to give away, one for myself) and carefully saved all the scraps. 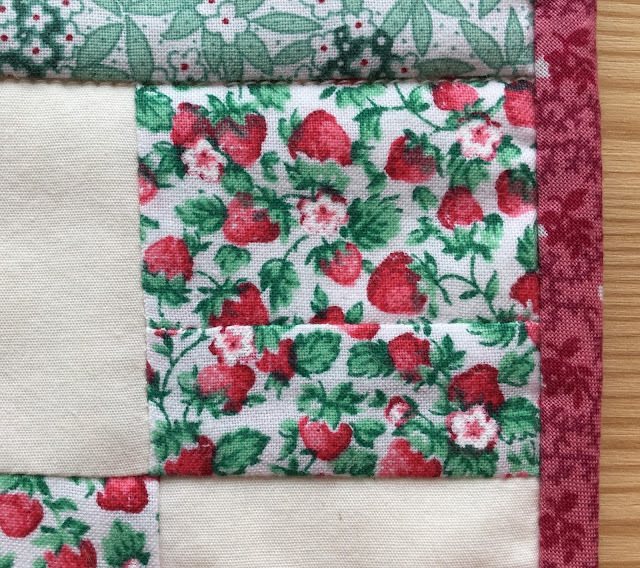 Over the course of a couple of weekends I pieced the scraps together to yield as many 2 1/2" squares as possible and then made up 4-patch squares with the muslin. Fifty 4-patch squares wasn't going to get me very far, so I (virtuously) drew again from my stash for some fabric to use for alternating plain squares. Finally I made a third withdrawal from the National Bank of Fabric for the binding fabric. 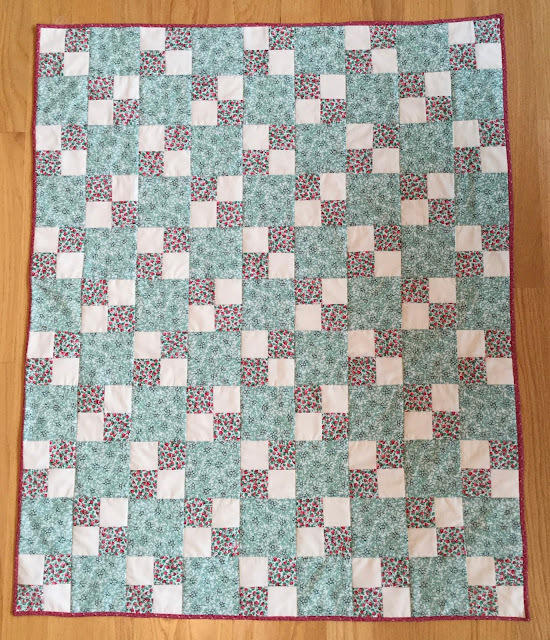 The quilt batting was cut from a full size batt that had gotten a little mouse-nibbled some years ago. By the time I'd finished the quilt, the daffodils were blooming and the doldrums were beginning to fade, though most evenings it's still nice to have a little lap quilt.